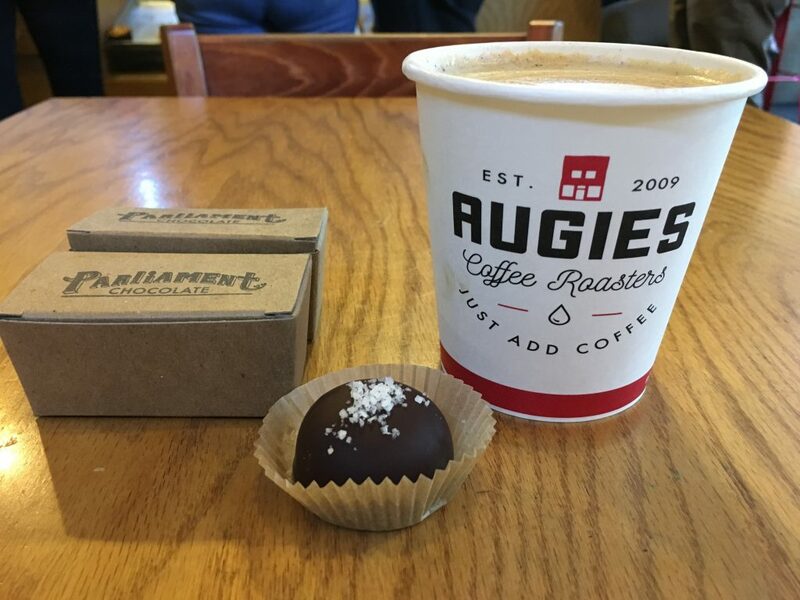 Augie’s Coffee & Parliament Chocolate in Redlands, Calif.
Do the words organic, non-GMO, farm-raised, fair-trade and ethically-sourced ring a bell? These labels have seen a growth in usage over the last few years as food companies and small businesses jump on the new wave of food trends. These labels have also become deciding factors in consumers’ daily choices, or so says the average millennial consumer. The wave of ethical eating in production, manufacturing, and consumption has become paramount to consumers in this day and age—particularly for millennials, who are becoming a large target for marketing. Big corporations and food chains are not the only institutions conforming to the ever-changing market. On the local level, small businesses are also beginning to cater to the demands of the new health and ethic-conscious consumers, even more so than corporations. Local coffee shops, like Lift Coffee Roasters in Riverside, or Parliament Chocolates in Redlands, and even vegetarian restaurants, like Oasis and Health’s Kitchen in Riverside, have been a part of the small collection of local shops around the Inland Empire that are now catering to the new of wave of conscious consumerism. For the average millennial consumer, product labels that include the familiar terms of organic, non-GMO and free-range have also become popular terms to gravitate towards when making decisions on what to eat. For local coffee businesses that have beans that are labeled as fair-trade or certified organic, it is all in the game of marketing. With companies throwing these labels around, it becomes even more important to pay attention to the ingredients and even look into these companies. One of the easiest ways to ensure the product is as promised is to go directly to the source. Farmer’s markets are a good place to start as well as going to palces that work with local farmers. Parliament Chocolate is a small business that dedicates their work to the production of artisanal chocolates made of ethically-sourced cacao beans. In most cases, the pseudo-science that backs some of the claims that these labels often propose has no conclusive evidence of true health benefits. And yet, the new wave of consumerism continues to flourish.